Great for any time of the year, a mobile flower crown making hen party is ideal for any bride to be who wants a creative, relaxed and unique hen party idea. With a relaxed atmosphere and a different, exciting hen party idea it's the perfect way to celebrate your special day with a twist on the classic hen night out. With a flower crown making hen party, you don’t need to worry about anything except having a great time as we’ll organise the whole thing and bring everything you need. The activity is led by a professional workshop leader who will show you some tip and tricks and be there to give you some inspiration. Whether you’re really creative or just want to learn something new and fun, this crafty activity will be right up your street! The professional will bring all of the materials you need to toally personalise your flower crown including a variety of faux flowers, wiring, and ribbons so you can create the perfect flowery accessory for you. The range of flowers will mean you can make a flower crown fit for any type of the year and whatever colours you want. The girly element to this experience is what makes this activity great for a hen party. 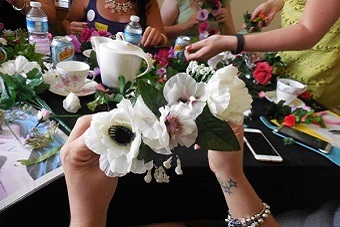 The whole mobile flower crown making hen party lasts about 2 hours, giving the whole hen group the chance to learn the basics, have a little practice and then create their flower crown in a relaxed, enjoyable atmosphere. What’s even better is that we’ll come to wherever you want! You can choose the venue, whether that be in an apartment, hotel, cosy holiday cottage or the comfort of your own home and we'll bring it all to you to put your mind completely at ease. All we’ll need is 30 minutes beforehand to set everything up ready for you to get stuck in straight away, and your willingness to have a great time. Everyone will be provided with a beautiful presentation bag to take your creations home in and so they don’t get damaged. If you’re looking for a completely laid back, stress free activity, a flower crown making hen party would be perfect for you! If you'd like a bit more info on this mobile flower crown making hen party or simply want everything organised for you, don't hesitate to give us a call on 0161 341 0052 and our events planners will be happy to help.